My new job requires a bit more of a commute than my last job and I have to admit that I am actually kinda looking forward to that because it means I'll have more time for audiobook listening*. 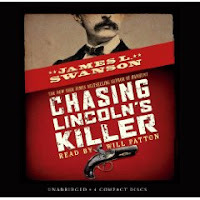 Chasing Lincoln's Killer by James L. Swanson is the recently-released adaptation of the author's adult title Manhunt: The 12-Day Chase for Lincoln's Killer and I found the book to b e absolutely riveting. Sure, I knew the basic details about Lincoln's assassination: John Wilkes Booth, Ford's theater, gunshot, etc. But Chasing Lincoln's Killer gives you all the gruesome details, blood and guts included, and it even mentions how John Wilkes Booth's crime changed the perception of Lincoln. He was a controversial political figure that was changed over night into a tragic hero, shot down in the prime of life. The text reads like fiction and this would be a great choice for those narrative nonfiction assignments that kids get from time to time. The audio would be an excellent choice for family listening with older kids (grades 5+) because adults will dig the historical facts, too. I say grades 5+ because it is a bit bloody in parts and Swanson goes into some detail about the gruesome injuries sustained by the president and Secretary of State William H. Seward (so take note if you're sensitive to that kind of thing). This book was booktalked at Anderson's Children's Literature Breakfast and former coworker J highly recommended Manhunt, so I'll probably pick that one up at some point, if only to look at the photographs. 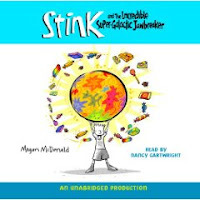 For something completely different, the other audiobook I listened to was Stink and the Incredible, Super-Galactic Jawbreaker by Megan McDonald. I'd been meaning to pick up one of the Stink books for quite some time, as that series is pretty popular. The story is funny, but the real draw, for me, was the incredible narration by Nancy Cartwright (you might be familiar with her as the voice of Bart Simpson). She gives each character his own distinct voice and she really brought this spunky story to life. I'd highly recommend Stink audiobooks to families with young elementary school kids and they're short so they're perfect for when you're driving around town. *I am such a geek, but if anyone would understand it's the readers of this blog, so there ya go. I tried STINK about six months ago and Nancy Cartwright's voice for Stink made my dog howl like crazy! So, no STINK for me. Audiobooks in general, however, are starting to grow on me. I'm glad you liked Chasing Lincoln's Killer. I might just have to read that one to see how they adapted Manhunt to a younger audience. Thanks for posting audiobook reviews. I love listening to audiobooks, and it makes such a difference getting real reactions and responses to them. I'm listening to Gregor the Overlander right now - have you tried that? Good epic quest if you like fantasy/adventure.